Cracking before washing I am extremely disappointed in the quality of this dog jersey. We have purchased other jerseys of a different style and never had an issue with the screenprinting starting to crack- even after multiple washings. This particular jersey started cracking just from trying it ON and OFF our dog as we normally would. 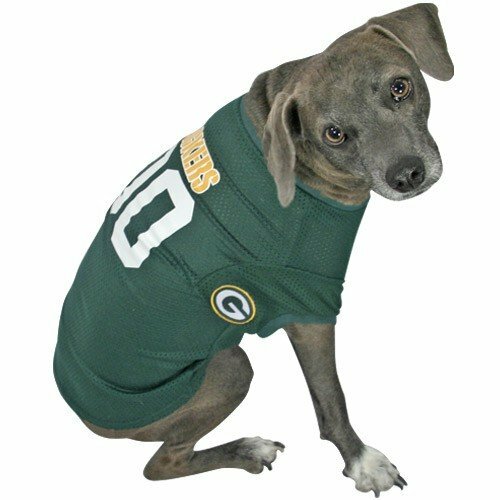 I spent more on this dog jersey than my own Packer t-shirt! Just poor quality in my opinion. What sold me was the REAL Packer patch emblem on the sleeve. I’d rather have my money back and buy a different jersey that I know will last more than one wearing. Very cute! The short is well made and fit the my 90 piund dog very well. I would recommend this shirt.